Reading Time: 9 minutesWell, I had been thinking, planning, speculating, urging friends to make this trip happen for the past 2-3 years, but was just not taking shape until this year. I finally decided to set out on a solo journey to tick off one item from my bucket list, that was a trek to Sandakphu, the highest point in West Bengal, especially during spring time, as it was the perfect time to witness the lovely Rhododendron blooms in the whole Signalila Range. As I didn’t want to delay until May, as the chances of rain would have been much higher then, I tried for 14th April and luckily got confirmed tickets which was perfectly matching with a scheduled fixed departure on 15th April’ 2017. Hence, on 14th April, I boarded the train to NJP (dep 11.55pm) which had a scheduled arrival of 10 am next morning. But, as usual train got delayed by 2 hours and instead I reached NJP by 12 pm. From NJP, I got into a pre booked cab which was arranged by our trek group and was shared by four other people from my trek group. It was very encouraging to meet a 62 year old retired man, who was also joining us for the trek to Sandakphu. From NJP, we travelled straight to Chitrey, from where we were to commence our trek next day. Chitrey at an elevation of 7000 ft (approx), is a picturesque hamlet falling into Nepal side, which is located just 3 kms uphill from Maneybhajan. I reached Chitrey at around 4pm. My fellow trek mates, who were travelling from Bagdogra had already reached an hour before us. The tower signal was almost negligible and if one tried a lot, could manage to get a Nepal network on their phone. After reaching Chitrey which took me almost 4 hours from NJP, the temperature suddenly dropped to almost 8-9 degrees, as it had started drizzling slightly. That day, we stayed at the trekkers hut which was pre booked for us. Since, it was our first day at the camp, we all were charged up and excited, and decided to set up a mini born-fire under partial windy conditions not just to enjoy the starry lit sky but also to utilise this opportunity to get acquainted with other members of the group. It was indeed a perfect way to end the day with conversation, introductions and greeting each other over a hearty dinner and not to forget a pitcher of Hot Tongba (local fermented hard drink made out of millet), which is a must try when trekking in this part of India bordering Nepal. The taste was bit weird and funny, considering the fact that it was a beer and that too a hot one!!! Got up at 6.30 am, and almost the last one to wake up. It was clear sunny weather outside, and the perfect day to begin our Trek to Sandakphu. As we had to trek for 9kms to Tumling (the next hault), we started our trek at 8.30am bidding goodbye to Chitrey. It was like one of those moments of “all my bags are packed; I am ready to go”!! As I reached a little ahead, I almost jumped with joy on witnessing my first sight of the Sleeping Buddha with mighty Kanchenjunga quite clearly. It was a mesmerizing sight of snow-capped peaks with clouds playing peek-a-boo. It was a beautiful sight with the lush green trees, and the pink & red Rhododendron blooms, complimenting each other in perfect harmony. We stopped at 11am after covering 3kms for some chai break. After having much needed break, we headed for Megama which was our stop for Lunch (another 3 kms from here). As we walked upwards, the weather changed suddenly and it was foggy and misty. So with our hunger pangs and tired bones we reached Megama at around 1 pm and hurriedly grabbed our wai- wai noodle soup, as that was the only lunch option. The weather was changing and we had to head to our destination which was another 3 kms from there, so we started off post our lunch without wasting much time. We finally reached Tumling at around 3 pm. Tumling is a small hamlet in Ilam District of Nepal at an elevation of 10000 ft (2970 mt). The view of Kanchenjunga was just spectacular from the balcony of our home stay. The day ended with laughter, discussion, rounds of warm tea and sumptuous dinner. Our guide Yogen (young little enthusiastic Nepali chap) came to wake us up by 5 am so as to rush to the view point, where the sunrise at Kanchenjunga was to be seen. I quickly grabbed my woollies and rushed to climb the small cliff like structure where already a small pool of tourist was standing to catch a glimpse of first golden rays on the peak. As the clock struck 5.30 am, we could see the first rays of sun, reflected on the mountain peaks. And within few minutes the entire sleeping Buddha was glowing with the ray of golden light. It was one of the most beautiful feeling ever!! Along with Kanchenjunga, we could see the other peaks clearly. Few tourists also ran a bit further up as locals said that even the Tibet range of mountains like Mt. Makalu, Mt. Lhotshe and even Mt. Everest was also visible. After breakfast, we started off at 8 am as today we had to cover a distance of 13 kms on our Trek to Sandakphu, towards Kalipokhri which means “dark or black lake”. Weather was bright and sunny and the view just spectacularly clear. Today, we also entered the Signalila forest range, which was full of pine, oak, bamboo and Rhododendrons trees. It appeared as if the entire mountain range was covered in brown patches but actually they were flowers blooming everywhere. We reached Gairibas at about 11am for our obvious tea break, and utilised the time interacting with few German trekkers who had come all the way to trek here. After Gairibas, we headed another 2kms uphill (this time) for our lunch, at a place called Kaiyakatta. Around 2 pm and after having lunch, I took off to cover the last 4 kms to Kalipokhri, taking couple of shortcuts enroute, which were steep and rough alley of stairs and the occasional mud path carved out by locals meandering through the mountains. I reached Kalipokhri at around 4.15 pm. Few others who were lucky to reach earlier braced themselves with hot tea and hot pakoras whereas unfortunates like me who made it a bit later, had to settle for cold tea and cold pakoras!!! Post the tea session, I decided to take a short stroll around the hut, although my knees and feet were aching terribly post the trek. I pass through a herd of mountain goats which locals were steering back to their home. I suddenly saw, the sun was setting amidst the cloud. It felt almost as if I was standing above the clouds, and the sun was looking like a golden ball settling just behind a mountain. This was by far the best view I witnessed on the trek to Sandakphu, and I was awestruck with this. My stay today was in a bamboo hut dorm style with one make shift toilet, which was totally outside the hut and secluded. So the idea of going to the toilet in the middle of the night was nothing less than a nightmare even more because our topic of discussion that night was spooky too. The night sky was crystal clear and the same was adorned with stars and infinite galaxy. I stood their star gazing for about 10 mins but it was impossible to stand and bear the chilly winds which was gushing through the clear night sky giving me shivers to the bone. We started for our final destination on our Trek to Sandakphu comfortably at 8.30 am, to Sandakphu (3636 mt) which is the highest point in West Bengal. We had to cover only 7kms uphill which was relatively easy. So, I took it easy and started at my own pace. But today was very cloudy and foggy and the visibility was very poor on the way. The entire trail, was full foggy and misty. The last 3 kms upto Sandakphu point was a steep hike. I finally made it to the top at 12.30pm, feeling accomplished. Although it was disappointing to find it still very misty and foggy up there, as I could not see any view around. In the evening, I remained confined to my room and took rest hoping to get a clear view the next day. I peeped out from my little window at 5 am in anticipation, if the weather was clear or not. Sigh!! There were clouds all over the sky. Yet my roomie and I decided to wake up from our slumber and give it a last shot, as after-all we had come all the way to Sandakphu to witness the mighty Kanchenjunga. But in-spite of rushing to the highest point at dawn, we could not see a clear sky and came back a bit disappointed. I was still positive and happy that all throughout our trek to Sandakphu, I could at least witness the peaks crystal clear right upto Sandakphu. So those memories were far cherished, than having to sulk or brood on the fact of missing the chance to catch a glimpse of the entire mountain range from Sandakphu. So after a hearty breakfast, we bid goodbye to our lovely cottage which was otherwise at a fantastic location and started our descent towards Sirikhola which was about 15 kms downhill from here. And this descent was surely very steep and tough on my wobbling and tired knees as I had to scale down from 3636 mts to 1900 mts (almost 6000ft downhill) in 15 kms. I started my descent very slowly. Initial 5 kms, which involved steep terrains, muddy shortcuts through the pine forest was ok. There was a steep descent just 2 kms before Gurdum which was supposedly our lunch stop. I made it to Gurdum at about 12.50 pm where all others along with some lip smacking Aloo parathas were waiting for me. Surely it not only comforted my gastronomical delight after such long, but also helped forget about the muscle pain for some time. Descent to Sirikhola was comparatively better than before. I crossed the lovely pine forest and river Teesta gave me a scenic company, flowing all the way along the trail. I finally reached Sirikhola trekkers hut at 4.30 pm. Our trek to Sandakphu was completed on a successful and rejoicing note. I can definitely say that I was very fortunate enough, that just after half an hour later, I reached Sirikhola, a hailstorm started and it started to pour incessantly. I was thanking my protective functions which just made me feel so lucky inside that I didn’t get stuck in hail storm. It kept pouring all through the night giving it a perfect end to my trek trails!!! I departed for Darjeeling , bringing my trek to Sandakphu, to an end, bidding all other goodbye as they left for Bagdogra/ NJP/ Home onward. My learning and take back from the trek to Sandakphu – It’s been a journey which was all about learning, realization and testing my potential. I came out of my comfort zone and lived my days out of my backpack, made friends, talked to locals, to understand the hardship, to appreciate each smaller little things which may seems very little but has a deeper meaning. I felt extremely content to have been able to tick off one more wish out of my bucket list. I now look at it, I realized that journeys are actually way more important than the destination. What I said not because I could not witness any stunning view at the top. But it is because, I trekked for 5 days covering about 45 kms chasing something which I could not get the view of. Still I feel that I could achieve the inner joy of finding my new love for mountains. I think I’m just hooked on to this and I am definitely going to take up many more treks. 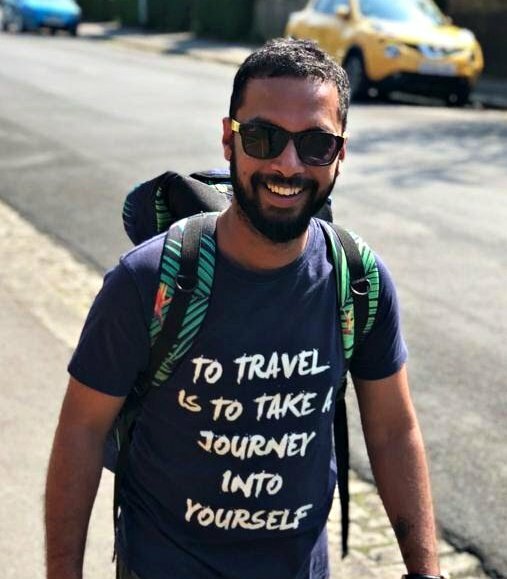 Bitten by the travel bug for life, madness rules me, life loves me and a wanderlust travel junkie defines me!!! Currently stuck with a corporate job to sustain my travel mania. I plan to travel to infinite places in my lifetime, for I realized that nothing is more rewarding than to gather new experiences and cherish memories. Truly believe that it is better to create memories, than to die with dreams. Thank you all so much for appreciating my first attempt in the world of blogging ..hope to jot down many more !! Yes true the feeling was truly magical indeed! This looks like such a fun time. Challenging too. I’d love to see the Buddha as well. As for trekking, it’s one of my fave things to do in beautiful natural scenes like this. What an adventure with beautiful views along the way! I’m glad you finally made this happen and tick it off your bucket list! I agreed with you that journey is more important than destination and it is a process of self-learning and realization! When I went for an Everest viewing I had a similar cloudy weather situation, although I did see it for a couple of minutes. Your Sandakphu situation seems similar to mine with the weather, the Instagram shot with the clouds is still a rare view to enjoy! The whol trek sounds quite challenging on the muscles and legs with the ascents, well done for making it! The picture of Kanchenjunga with the red tree is a stunner! Sandakphu has long been on my list along with Goecha la. I have trekked a lot but never in the North East India. The fact that it is 6 days trek makes it very doable. I did roopkund trek and Everest base camp trek which had drained me but were rewarding! I felt like I was right there there with you the imagery was amazing! Despite some of the clouds and fog, your photos and the experience still look amazing. I love the sentiment at the end it really is all about the journey! Thank u so much and yes joy was indeed inevitable . Weather sure plays a part in outdoor trips like this one! So much to consider like clothes for changing temps. What a fantastic adventure – getting outside your comfort zone like this is a great idea!